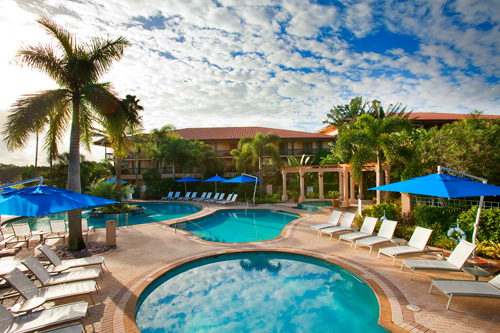 It’s a great time of year to be a spa lover and to visit the Palm Beaches. October is Spa and Wellness Month in the Palm Beaches which means that a plethora of Palm Beach area spas and wellness institutions have banded together to offer spa-tastic throughout the entire month. Throughout October, a plethora of soothing indulgences, peaceful sessions, and even delectable delights are available at wonderful savings. Best of all, you’re helping to save lives, as part of the proceeds from your visit will go to the Palm Beach County Chapter of the American Cancer Society in honor of Breast Cancer Awareness Month. What could be better than that?!! A twofer! Here are a few of LadySpaSpa’s favorite highlights of the Spatober events or offers you don’t want to miss this month. Touting four decadent 50-minute treatment options for $99 each plus gratuity, each includes a mini bottle of Rose Prosecco and access to Waters of the World Healing Pools. The Waters of the World Healing Mineral Pools can be found within the expansive 40,000-square-foot European-style spa, exclusively at PGA National. Renowned for its healing properties the spa offers relaxation and rejuvenation at every turn, complete with sauna, steam room, indoor Jacuzzi, and two healing pools. The Spa’s therapeutic pools include The Dead Sea Pool and The Pyrenees Pool, a chilly salt pool that helps moderate body temperature and mood swings. Spa guests are granted access to the pool deck for lounging all day with any spa treatment as part of their “spa day.” While there be sure to check out a BuzzPop Cocktail now available for sale at the Waters of the World Cafe! These boozy adult push pops are gluten-free, all natural and one of my faves! The Delray dining establishment will offer a “Think Pink!” smoothie, featuring: maca, strawberries, almond milk, vanilla protein and almond butter. Just mention DTPB Spa & Wellness Month and receive 10% off any wellness MRKT skincare product. Led by a certified instructor, Manatee Lagoon offers one-hour yoga classes against the calming backdrop of Lake Worth Lagoon. Saturday morning yoga classes held from 8 a.m. to 9 a.m. each Saturday throughout the month of October will be offered FREE with a yoga mat. Find the latest fashions and your moment of zen at The Gardens Mall. Midweek Meditation will guide guests through breathing techniques and gentle body movements. 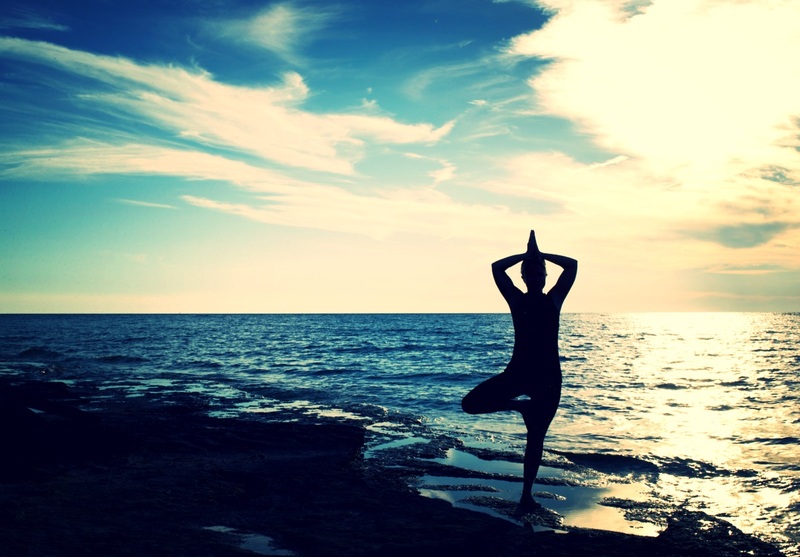 Amp up your fitness routine and general well-being with complimentary Yoga, stretching and Zumba classes. As an added bonus smoothie samples from participating retailers will help keep energy levels high. 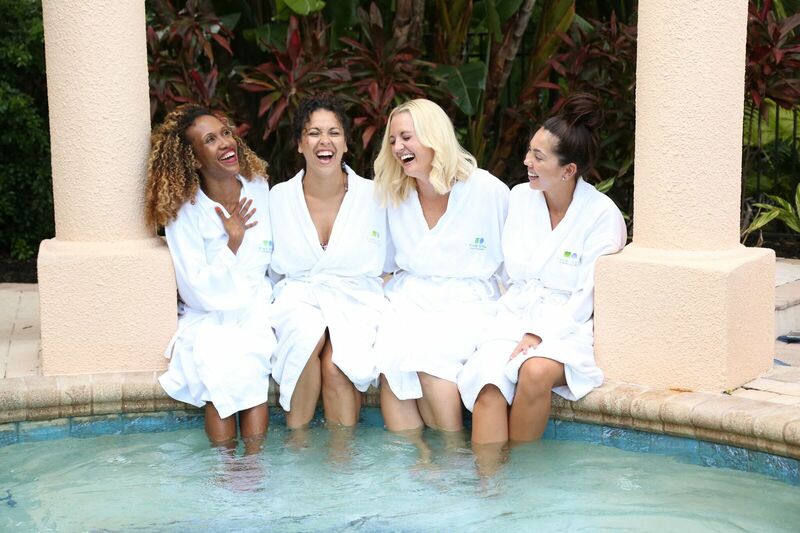 Spa & Wellness Month is brought to you by Discover The Palm Beaches, to celebrate not only an incredible collection of spa and wellness experiences in Palm Beach County but to showcase The Palm Beaches, The Best Way to Experience Florida®. Discover more about The Palm Beaches at www.thepalmbeaches.com. Get ready for Spatober in the Palm Beaches! A spa girlfriends getaway. Left to Right – Danielle Faust, Erica Villalobos, Michelle Olsen, Annie Alvarez. For the second year in a row, Spa & Wellness Month in The Palm Beaches Returns throughout October 2017, and this year it’s for a good cause. In support of Breast Cancer Awareness Month, all participating businesses will donate a portion of their proceeds to the Palm Beach County chapter of the American Cancer Society. More than 30 offers are available, including spa treatments starting at as little as $45, wellness experiences starting from $15 and healthy eats starting at $11. This is definitely something to take advantage of. Keep in mind that many of the resort spas in the area might charge a little more, but you have to consider that you are getting way more than just a spa service at resort spa but rather a full day-cation experience if you plan accordingly. Many of the resort spas have pools, jacuzzis, steam rooms, saunas, relaxing lounges with tea and goodies to nibble on and more! So if you are looking to have a little “me time” definitely consider doing it for a good cause during October and in turn support the American Cancer Society. Cost: $89 per treatment including a mini-split of Includes a mini bottle of Rose Prosecco. Roses Facial (50 minutes): Breathe in the sweet scent of rose and experience the softness of natural marine and plant extracts for a sensory, soothing facial experience by Phytomer. After a rose-mineral mist, the complexion is polished with an AHA scrub for a petal-soft texture, then anointed with Rosee Soin rose oil to detoxify and strengthen skin. Blushing Pink Rose Massage (50 minutes): Allow us to infuse your skin with a serum infused with roses and mixed with a nourishing oil featuring organic sunflower seed oil. Pretty in Pink Manicure|Pedicure (75 minutes): Immerse in a refreshing bubbling soak that both relaxes and invigorates. A sugar scrub made with Square One organic vodka and raspberry extract thoroughly banishes dry skin and hydrates deeply with natural oils. A light drizzle of softly scented melted shea butter, cocoa and mango butter makes for a lavish finale. Specials are valid Sunday through Friday. Tax and gratuity will be added. 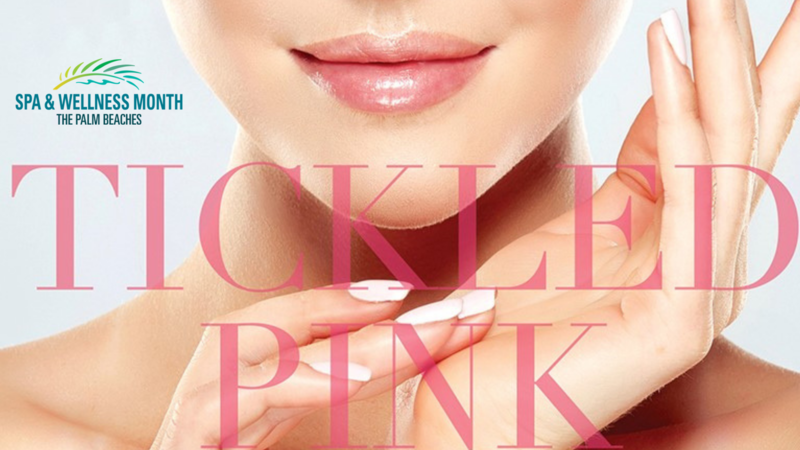 For each Tickled Pink treatment booked, $5 will go toward a breast cancer charity. The Black Peel Facial: This new facial from Dermophisiologique uses a carbon mask rich in natural actives such as kaolin and microspheres of active charcoal that provides deep cleansing. It absorbs skin impurities such as sebum, microorganisms, and pollutants from the environment, while olive kernel powder exfoliates dead skin cells mechanically, favoring skin regeneration and promoting a natural glow. 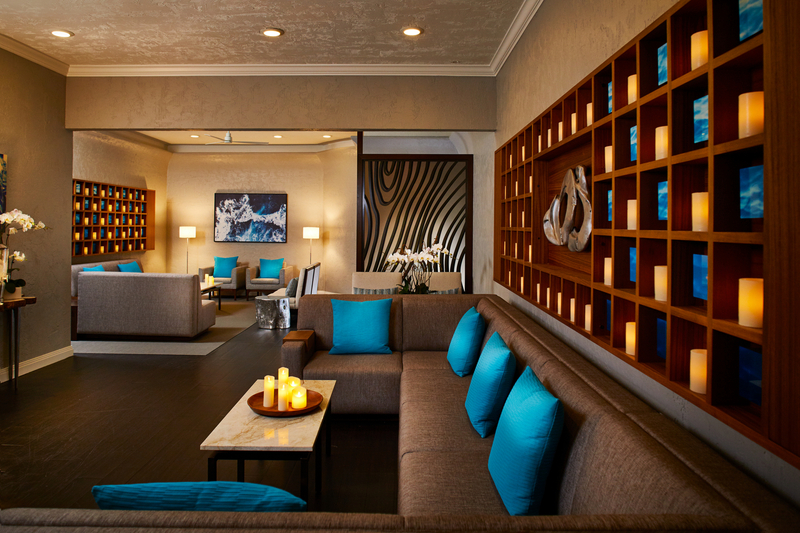 The spa will donate 5 percent of each service booked to the American Cancer Society. SilkPeel Facial: SilkPeel Dermalinfusion or hydro-dermabrasion skin treatments combine noninvasive exfoliation with the infusion of skin-specific topical solutions to improve and revitalize the skin. An advanced form of microdermabrasion, SilkPeels are unique because they do not use crystals. One treatment per person. Twenty-four-hour cancellation required. The spa will donate 5 percent of each service booked to the American Cancer Society. Diamond Microdermabrasion: This skin resurfacing treatment removes the topmost layer of skin, leaving it more supple and vibrant (includes cherry light enzyme peel). It is noninvasive, painless and requires no downtime. Diamond microdermabrasion may improve discolored skin, acne-prone and scarred skin, and wrinkles. Pink Power Bol: Anytime in October, visit Bolay and order the Pink Power Bol for $12; $1 of each order will benefit breast cancer research. Lunch at Serenity: From $11, enjoy a healthy lunch served with a selection of organic teas. 10% of the cost will be donated to charity. Blueline Goes Pink for the Cure: Take to the calming waters in your pink to support breast cancer awareness during October with a one-hour paddleboard yoga class or a one-hour paddleboard rental. A donation of $5 from each rental will be made to charity. Yoga in the Garden: Relax, refresh and reflect while practicing yoga in the tropical landscape of Mounts Botanical Garden. This all-levels class includes infused waters with herbs and spices from the garden. Classes run 8–9 a.m. each Sunday. Pink in the Sunshine Two-Hour Paddleboard Rental: Wear your pink gear in support of breast cancer research and enjoy a discounted two-hour paddleboard rental. A complimentary picture of your group in their pink attire will be taken and emailed to all guests. The offer is also valid for those guests who opt not to wear pink, but we will be encouraging all guests to dress in pink for October. Online promotion code is THINKPINK. Of each $20 rental, $5 goes to charity. Pink Power Paddling: Every Saturday in October, wear pink and join Visit Palm Beach for a morning sample paddle of the South Cove Estuary in downtown West Palm Beach. Choose a single or double kayak or SUP (stand-up paddleboard). Available 9:30–10:15 a.m. Space is limited. Reserve online. Must be wearing pink to receive the $15 rate. Of each $15 rental, $5 goes to charity. For a complete list of all the restaurants, spa treatments, and wellness offerings visit www.Spatober.com. The Spa at PGA National is thrilled to announce it will participate in the second annual Spa and Wellness Month in the Palm Beaches this October. The month-long promotion throughout Palm Beach County highlights the array of wellness-focused offerings available throughout America’s First Resort Destination®. Designed to rejuvenate the mind, body and soul, these featured spa therapies, wellness experiences and healthy treats are available at exclusive, limited-time prices only throughout the entire month of October 2017. With the irresistible price of just $89 plus gratuity, take your pick from our Tickled Pink Menu featuring your choice of a 50 minute Roses Facial or Blushing Pink Rose Massage, or a 75 minute Pretty in Pink Manicure, Pedicure. In support of Breast Cancer Awareness Month, the Spa at PGA National will donate $5 of the proceeds for every Tickled Pink service booked to the Palm Beach County chapter of the American Cancer Society. Not only that but all three services are accompanied by a mini bottle of rose prosecco. All three options will tickle your fancy so much it will be difficult to choose just one, so don’t. You can take advantage and choose more than one! 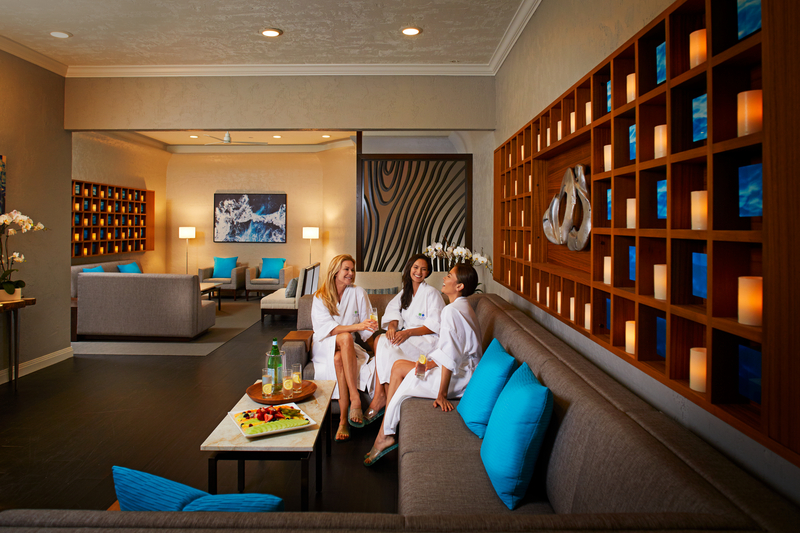 The Spa and Salon at PGA National just recently underwent a revitalization to the ladies lounge area including all new amenities like the indoor jacuzzi, sauna, and steam room. Additionally, the relaxation lounge area has a modern new look! When booking your service keep in mind these specials are valid Sunday through Friday only for the entire month of October. Call 561.627.3111 to book. I highly suggest planning ahead and booking in advance. The Spa at PGA National recently celebrated their recent revitalization with a ‘50 Shades of New’ Spa Masquerade event on Wednesday, March 29, from 6 pm to 8 pm. The event was emceed by the local celebrity DJ, Josh Cohen: Host of the “The Hometeam” on ESPN West Palm. Past clients and loyal beauty partners were in attendance such as MoroccanOil, Phyto, Pure Fiji, Phytomer and specialty pop-up boutiques. Party goers enjoyed passed hors d’oeuvres, champagne, beauty samples, and a decadent dessert bar as they indulged in mini spa treatments like chair massages, polish changes, a braid bar, live Bamboo Massage demonstration, paraffin hand treatments and more. A sultry musical vocalist and saxophonist duo entertained attendees with both the classics and romantic modern day hits by the Waters of the World pools. 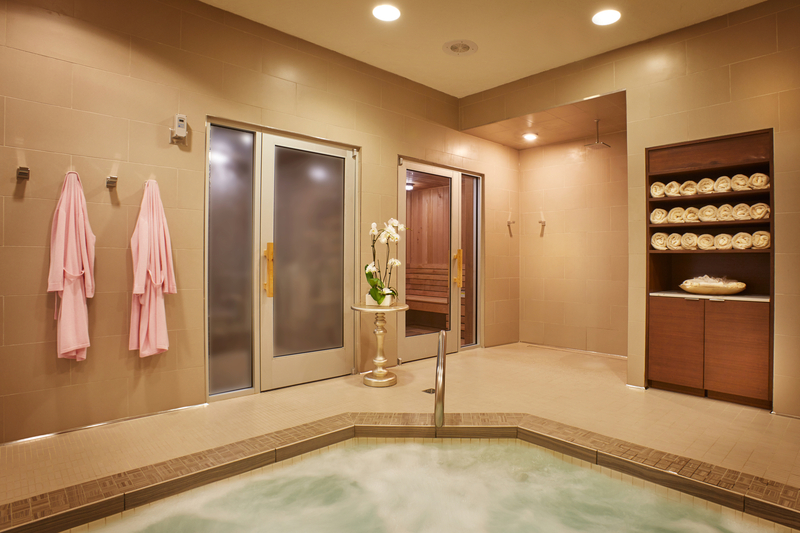 The million dollar Spa renovation recently unmasked in March, features an all new contemporary ladies lounge area, new sauna, steam room, indoor Jacuzzi, girls locker rooms and brand new furnishings at the Waters of the World pool deck. Attendees were sent on a scavenger hunt where they were requested to visit each of the renovated areas of the Spa to enter to win exciting giveaways. Corrine Whitaker, wearing the most creative spa masquerade themed costume hand made from paint color swatches scored a spa getaway for two complete with a stay in a spa suite and spa treatments for two. All of us would like to be healthier, look better, and live well, both physically and spiritually. Living well is almost the entire world’s shared dream. As everything that is precious to us has been honored with a special day, why is it that we don’t have a special global day dedicated to the only thing that is truly valuable to all of us…living well? 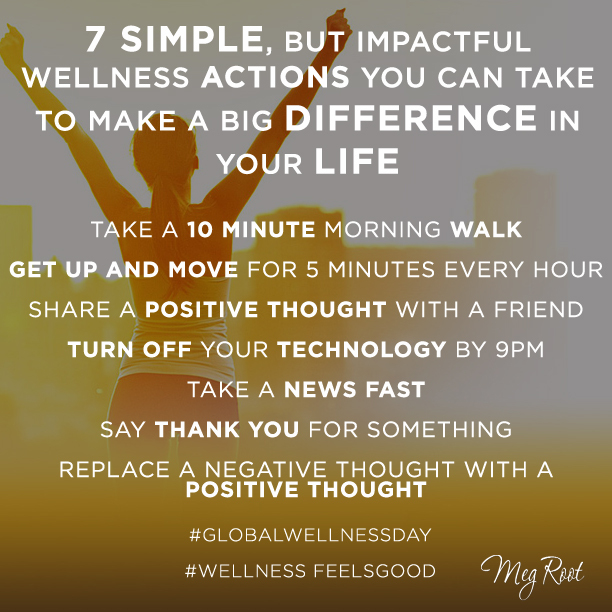 We can now answer this question by saying, “It now exists!” This special day is called Global Wellness Day. With the slogan, “One day can change your whole life,” we celebrate Global Wellness Day on the second Saturday of June every year as an international day dedicated to living well. Like thousands of other people, say “Yes!” to this special day that is spreading world-wide from Turkey all the way to the United States! Like thousands of people, say “Yes!” to this special day spreading world-wide from Turkey. In honor of the celebration, The Spa at PGA National is offering a one day only $99 (gratuity additional) Swedish Massage with day pass to the resort’s private 33,000 sq. ft Sports & Racquet Club offering a plethora of free classes for those who wish to take advantage. What can you do to make a change promoting wellness in your life? 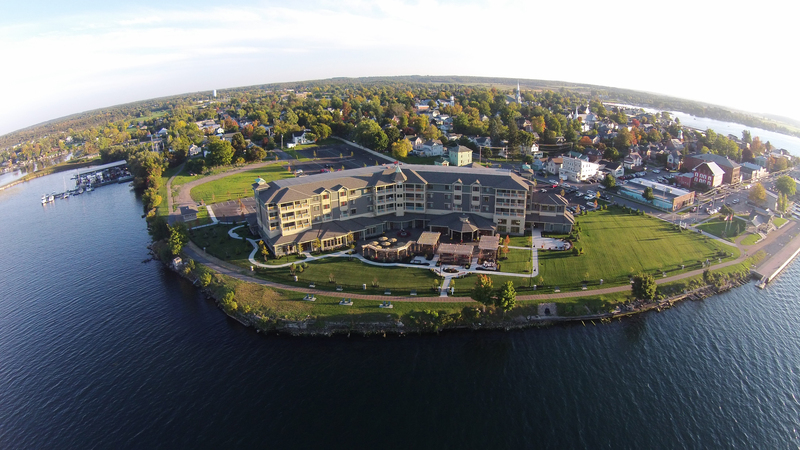 Taking a cue from Mother Nature, the AAA Four Diamond-rated 1000 Islands Harbor Hotel will welcome the start of spring with a Spring Fling Wellness retreat to celebrate the renewal of the mind and body. Yogis (newbies and advanced) are invited to join Liz Price-Kellogg and Kristen Taylor, authors of For the Love of Food and Yoga: A Celebration of Mindful Eating and Being on April 23 for a day of yoga, cooking instruction paired with mindful eating practices and more. The cost of the day long retreat is just $79. Guests who’d like to stay the night can take advantage of a $109 rate. Guests can reserve their space by calling 315-686-1100 ext 7012. For reservations visit www.1000islandsharborhotel.com.